The Bristol Beaufort was a WW2 torpedo bomber developed from the Bristol Blenheim bomber and entered RAF service in 1939. The Bristol Beaufort served extensively with the RAF, RAAF and the Royal Navy's Fleet Air Arm until late 1944. 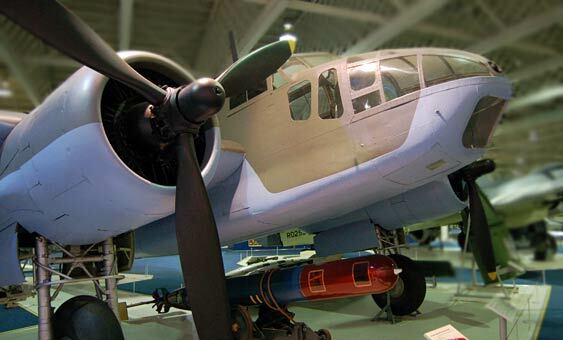 The Bristol Beaufort was larger, heavier and had more powerful engines than the Bristol Blenheim and was further developed in to the successful long-range night-fighter the Bristol Beaufighter, the Beaufighter was eventually converted into a torpedo bomber and replaced the Beaufort in the torpedo bomber role. A total of 2080 Bristol Beauforts were produced, production being split fairly equally between England and Australia. Although designed primarily with a torpedo bomber role in mind it was mainly was used in a conventional bomber role although it was notably used as a torpedo bomber on the attacks on the German battle-cruisers Scharnhorst and Gneisenau in the German occupied French port of Brest during 194o and 1941. This picture of Bristol Beaufort VIII is Copyright © June 2014 Siteseen Ltd. We only authorise non-commercial picture use and particularly encourage their use for educational purposes. This Bristol Beaufort VIII picture is not in the Public Domain. 3) Use of this Bristol Beaufort VIII picture, or any of our pictures on websites re-distributing copyright free material is strictly prohibited.